I was in the mood for something like Gilbert Hernandez’s Palomar collection, but the library didn’t seem to have anything along those lines. They did have collections by both Gilbert and Jaime Hernandez, as well as several by Jaime Hernandez alone. It was one of the latter that caught my eye. While I didn’t enjoy it as much as I had hoped I would, it did speak to a question raised by another Hernandez collection. The original setting had superheroes in the way our world has rock stars; they were around, but the odds were that mundanes never got to meet them. One of Maggie’s friends, Penny Century, was a genuine adventurer who kept hoping she’d have an origin. 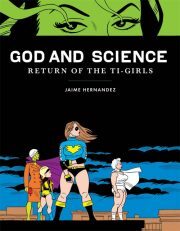 Thanks to God and Science: Return of the Ti-Girls, I now know that’s not the full story. Once upon a time Margarita Luisa “Maggie” Chascarrillo dreamed of being a “pro-solar mechanic”; her pulp-SF adventures took her around the world. 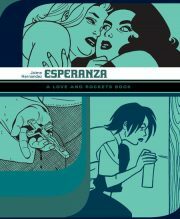 In 2011’s Esperanza, the fifth volume of the Locas stories of graphic novels, Maggie is a middle-aged apartment complex manager. Her best friend and occasional lover Esperanza “Hopey” Glass is studying to be a teacher’s assistant, while doing her best to ignore the slow erosion of her relationship with her current lover, Rosie.